Don’t like heights? 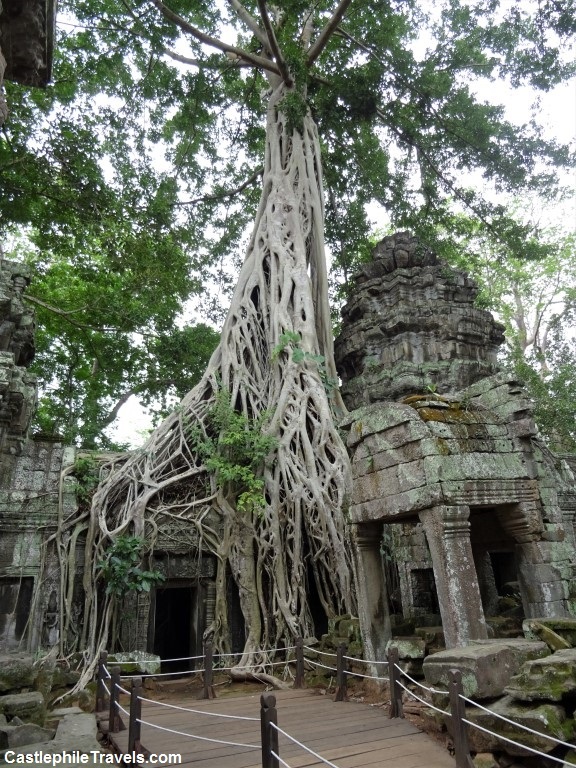 Then Ta Keo might not be the temple for you! 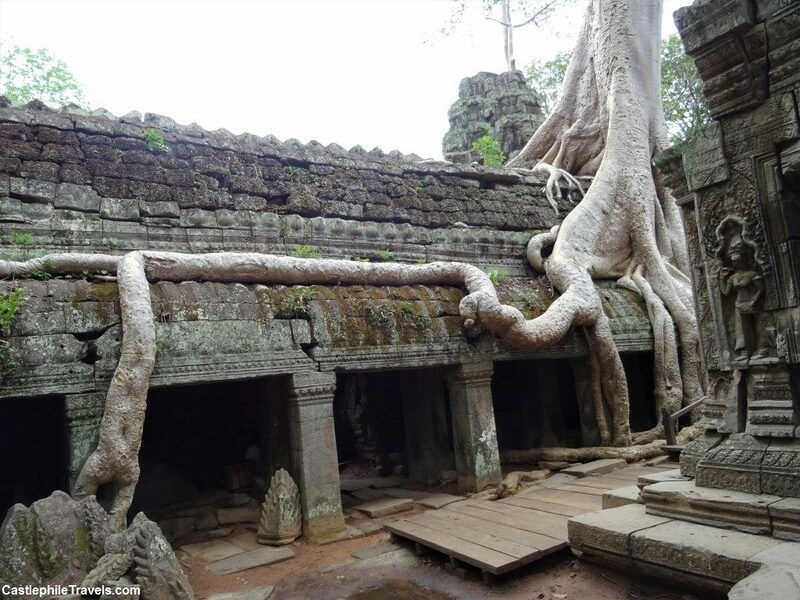 Situated to the north of Ta Prohm, Ta Keo was built during the reign of Jayavarma V (968 – 1001) and is thought to be the first of the Angkor temples to be built of sandstone. 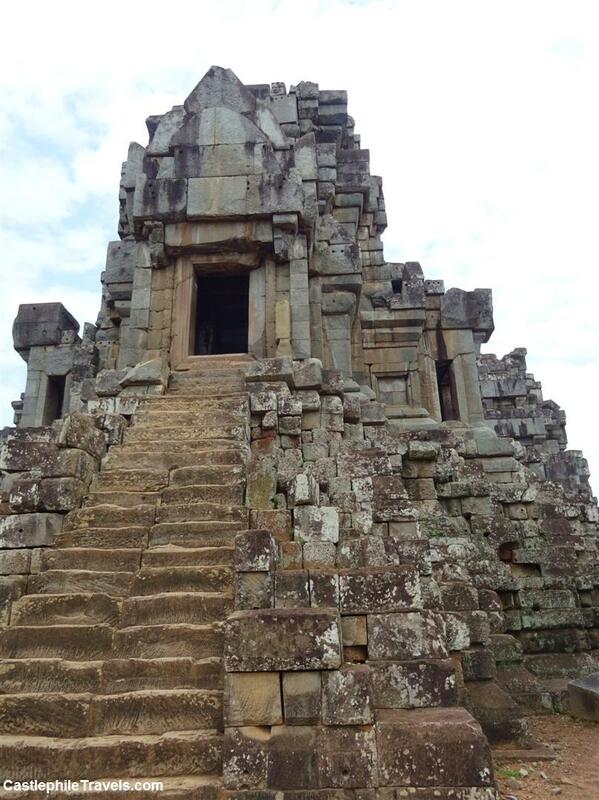 However what most captured my attention during my visit to Ta Keo was the stairs that visitors must climb in order to reach the top of the pyramid-like temple. 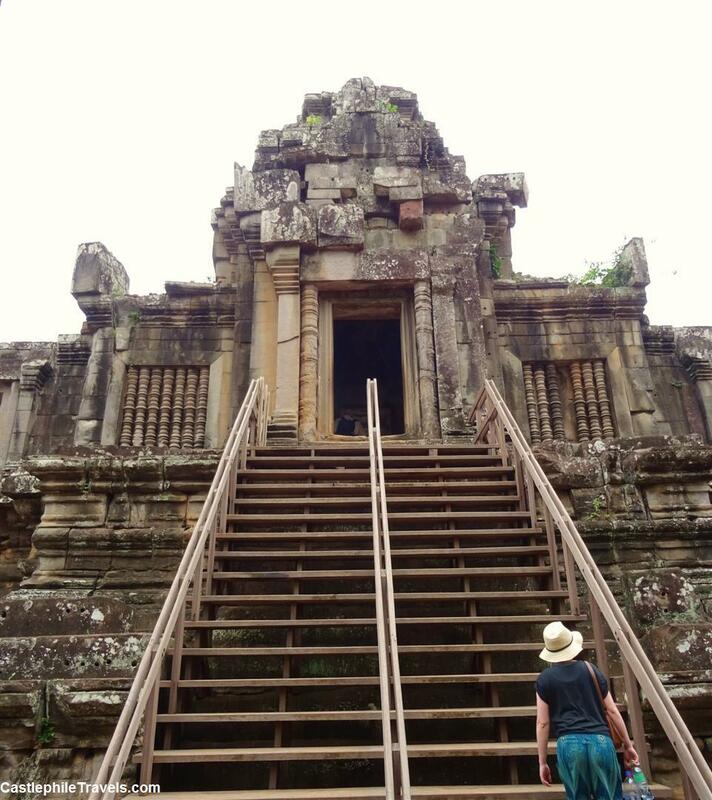 I love the challenge of climbing to the tops of hills and belltowers and Ta Keo offered me another! 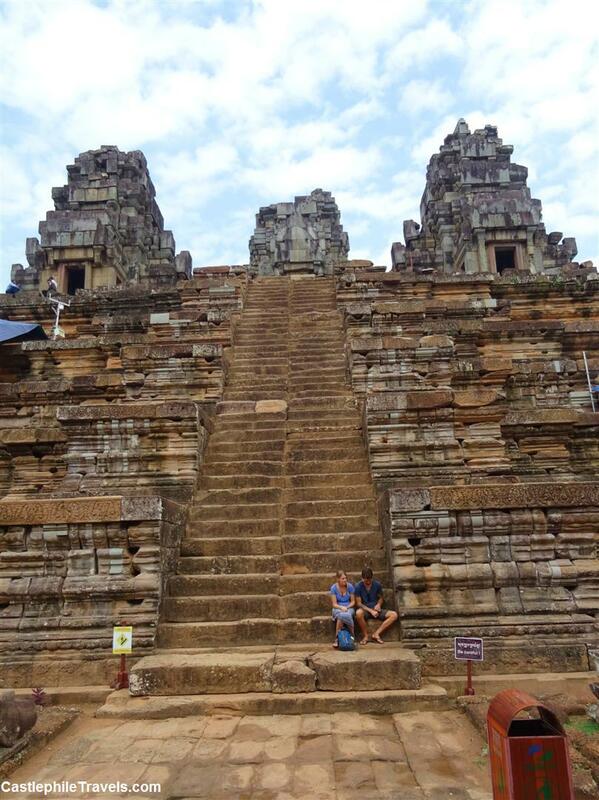 In order to enter the temple compound itself, you have to climb up a set of wooden steps. These are easy compared with what’s to come – there are handrails and the steps are set a reasonable amount apart. The second flight of stairs are more discouraging. The stone steps stretch up towards the sky so far that you can’t see what’s waiting for you at the top of them. 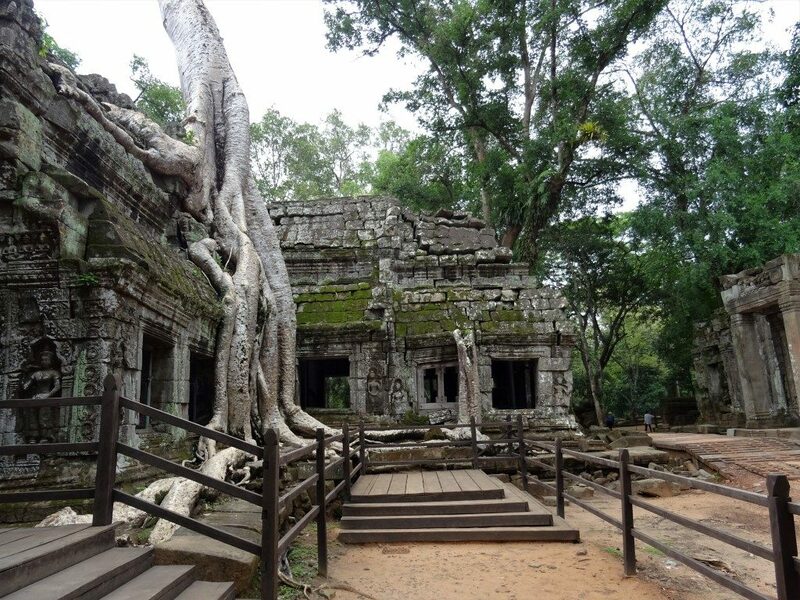 Even if you don’t make it to the top of the third flight of stairs, you can still take a rest, catch your breath, and look over the Cambodian jungle at how far up you have climbed. Once you’re back down on the ground level, make sure you look up at the top of the central tower as it pokes up above the wall that surrounds the temple. How fantastic it feels to know that you’ve conquered all of those stairs! 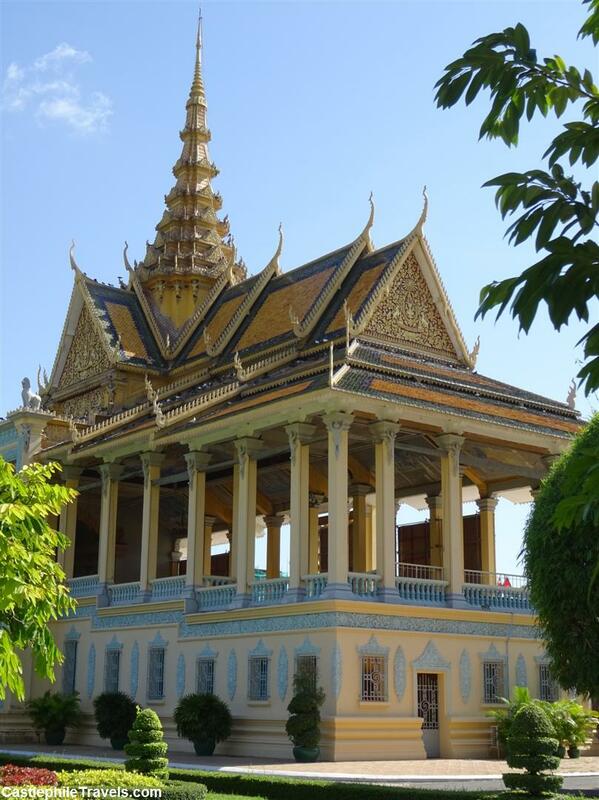 The Royal Palace in Phnom Penh was constructed on its current site in the mid-eighteenth century after King Norodom relocated the capital from Oudong to Phnom Penh. 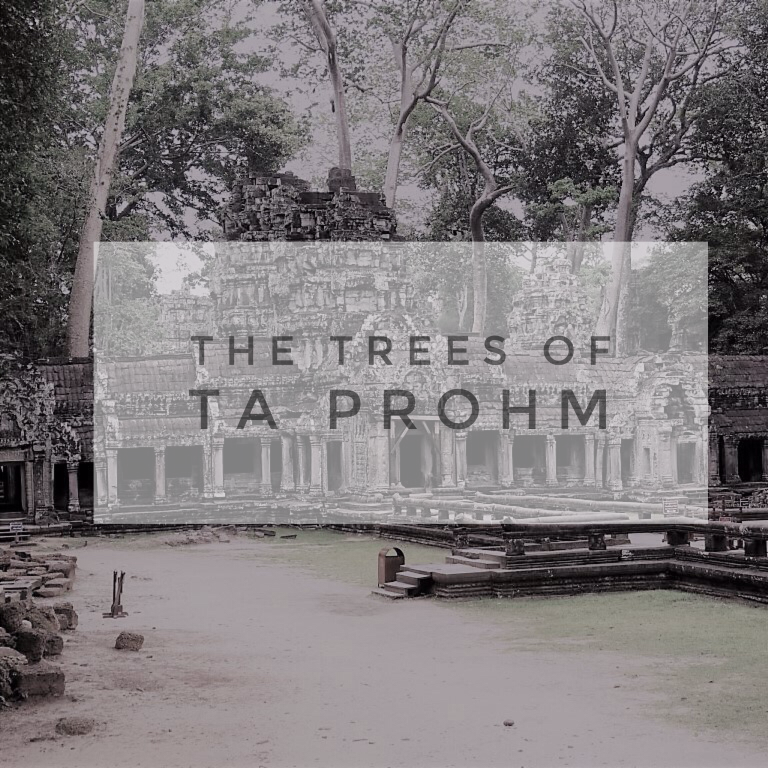 It contains three separate compounds – one area housing the palace grounds, another containing Wat Preah Keo, and a final area where visitors can view displays of traditional costumes, music, and artefacts. 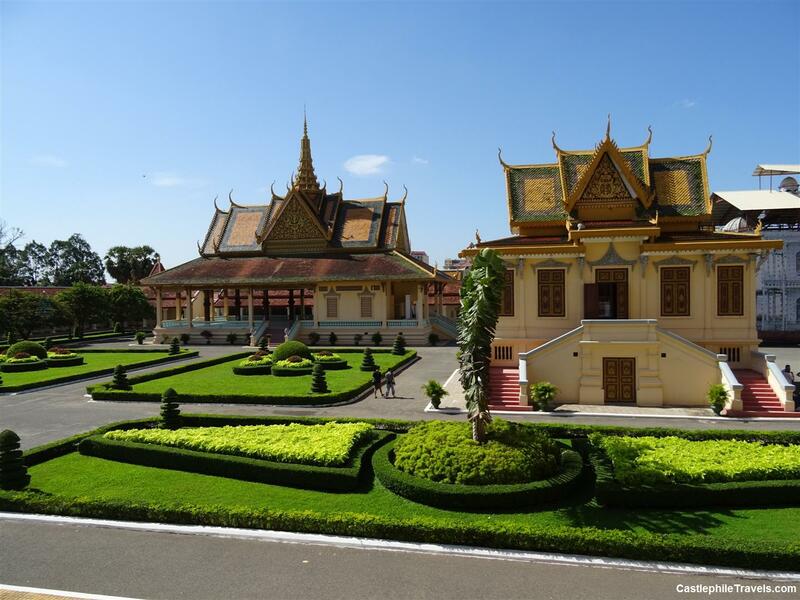 The Royal Palace of Phnom Penh is the official residence of King Sihamoni, and because of this many buildings and spaces are closed to visitors. 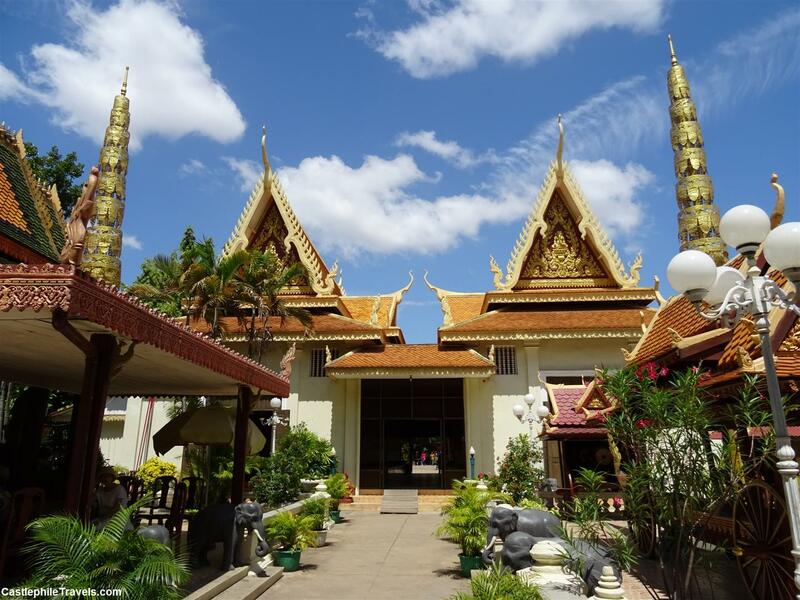 However, there are some that remain accessible: you can glimpse the opulence of the throne room, pay your respects in ‘The Silver Pagoda’ of Wat Preah Keo, and learn more about Cambodian traditions and culture in the exhibition halls. 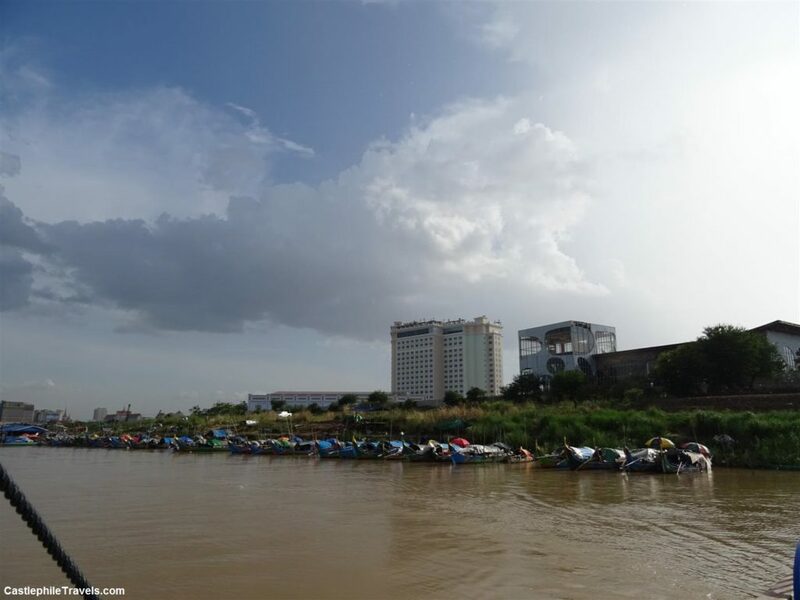 Where is the Royal Palace of Phnom Penh? 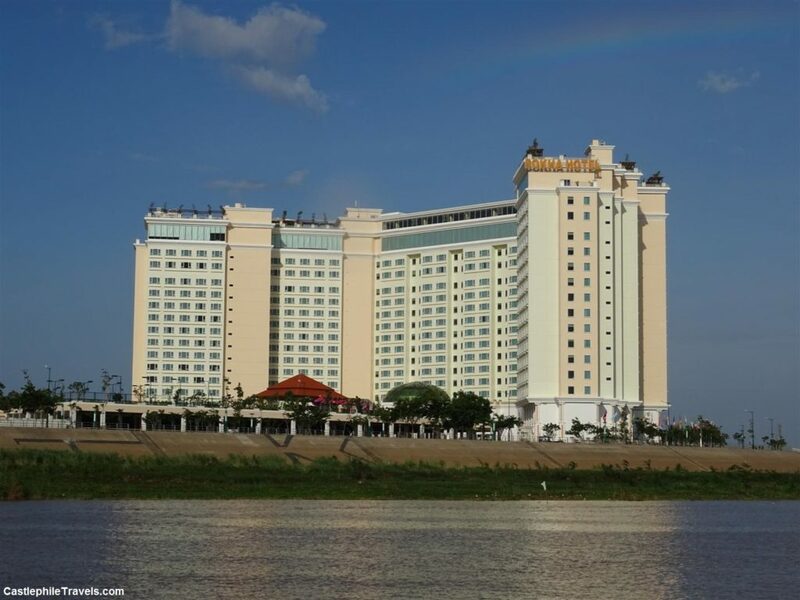 The Royal Palace is located on Sothearos Boulevard near the riverfront of Phnom Penh, the capital city of Cambodia. 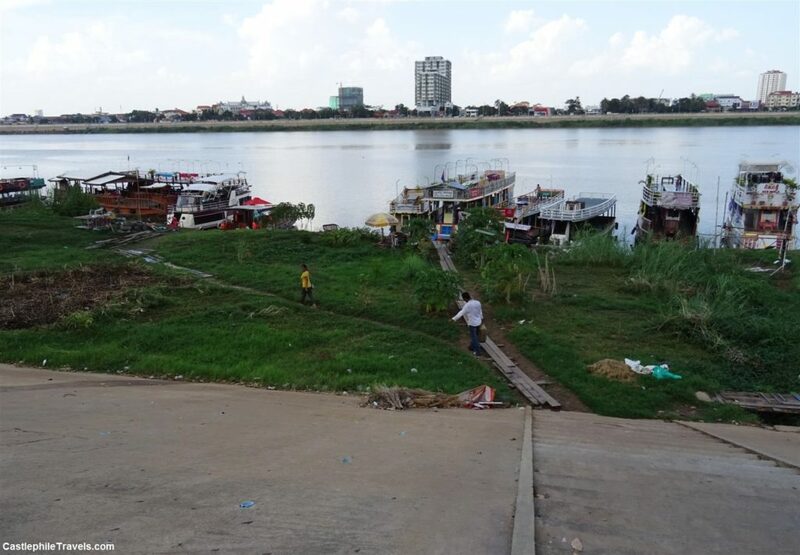 The easiest way of getting to the Royal Palace is by tuk-tuk (although if your accommodation is on the riverfront, then it could be just as easy to walk there!). 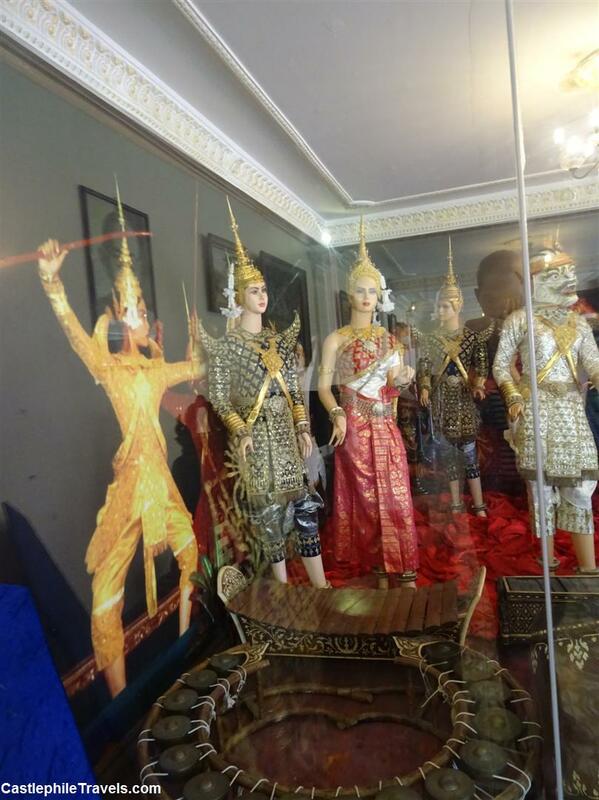 All visitors must conform to dress standards in order to enter the Royal Palace grounds. You will need to make sure your shoulders and knees are covered – a top with sleeves or a T-shirt, with three-quarter length trousers or a long skirt is enough. It’s also a good idea to wear shoes you can easily remove, as you must take your shoes off in order to go inside the Silver Pagoda. 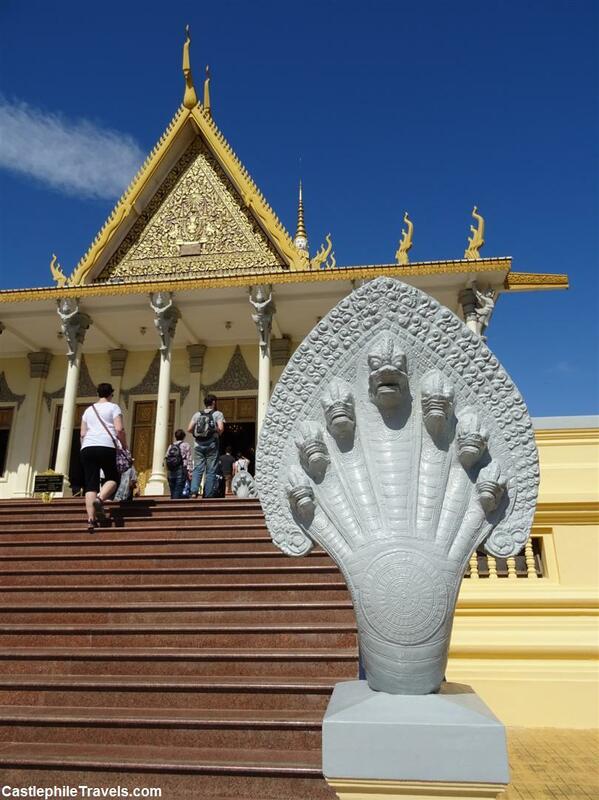 A naga stands at the foot of the steps to the throne room. It can be a bit disorienting as you enter the Royal Palace grounds, pass through the entrance gates and come out on to a large open area with manicured gardens. 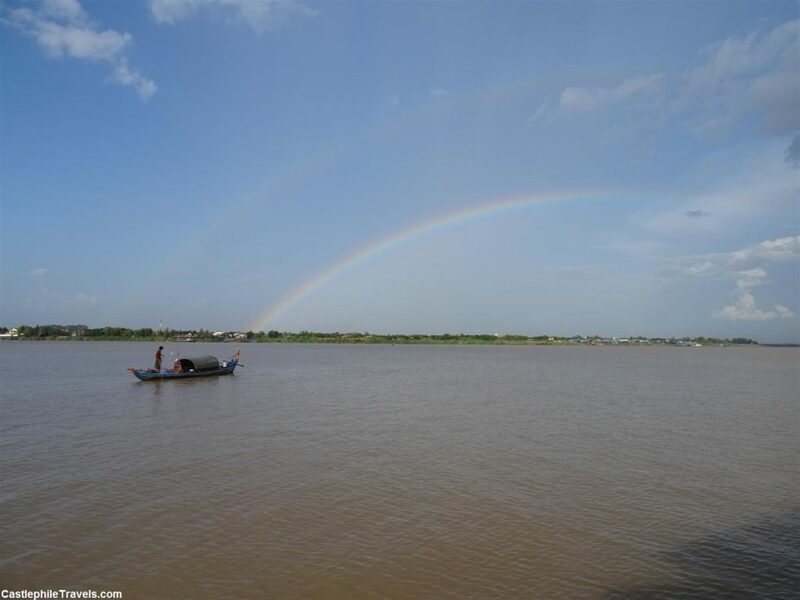 Don’t worry – a map of the grounds is provided with your entry ticket, and shows the expected way of visit, passing by Preah Tineang Tevea Vinichhay, Hor Samritvimean, a model of Angkor Wat, the Stupas, Wat Preah Keo, Kailassa Mountain, the Reamker Mural and the Exhibition Halls. The areas of the palace grounds that are prohibited to visitors are clearly marked with signs. 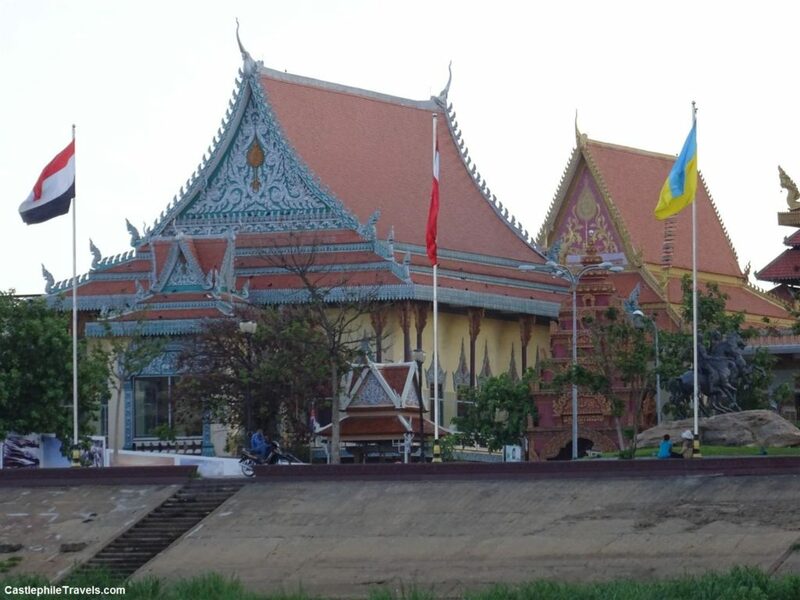 If you lose your map, there is one on the wall between the Royal Palace and Wat Preah Keo compounds. Preah Tineang Chanchhaya is the royal throne hall. 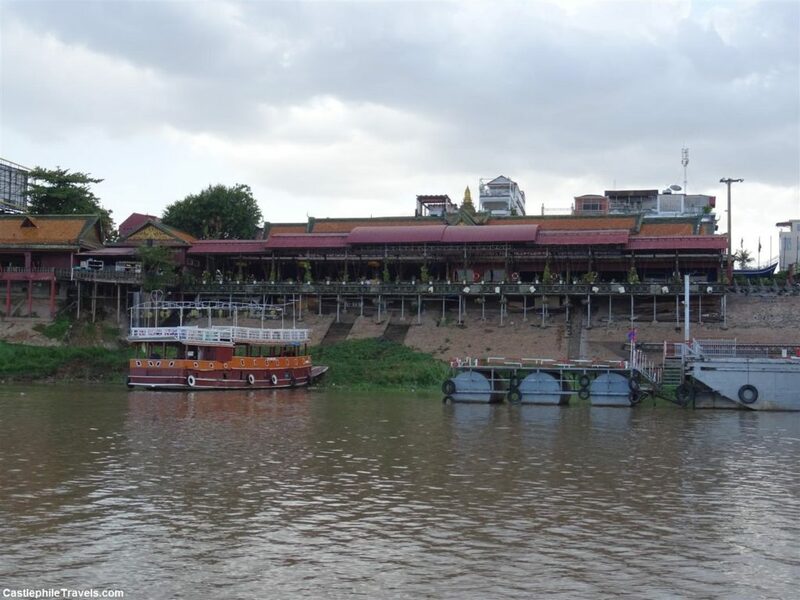 Built in 1917, it is the place where coronation ceremonies and meetings with foreign dignitaries are held. While you can’t step inside, you can view the throne room with its thrones and beautiful chandeliers through the open windows that surround the hall. Photos of the inside of the throne room are not allowed. The main spire of the throne hall is magnificent in itself. 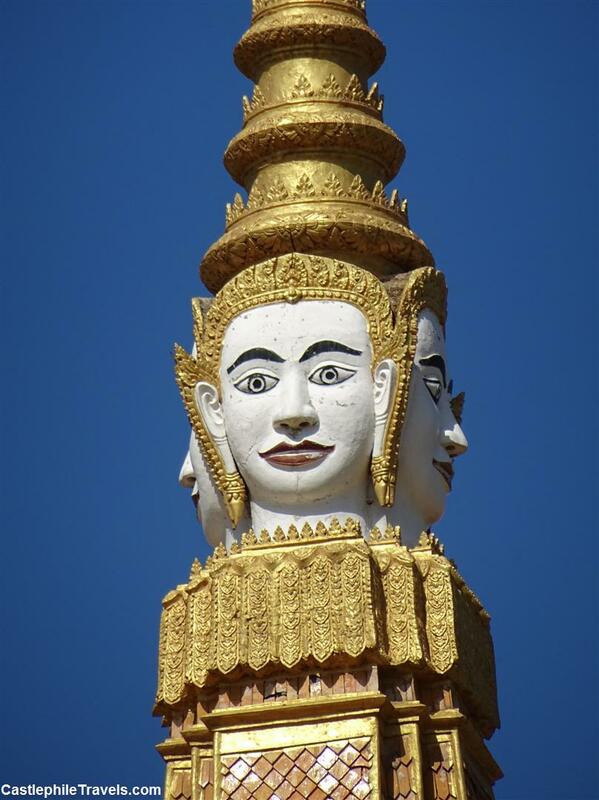 Standing 59 metres tall, it displays four faces of Brahma. The only other building within the palace compound that we were able to go inside of was listed as ‘Hor Samritvimean’ on the map we were given. It contained a collection of costumes and coronation regalia, including the seven outfits pictured below, whose mannequins were named ‘Monday’, ‘Tuesday’, ‘Wednesday’, ‘Thursday’, ‘Friday’, ‘Saturday’ and ‘Sunday’. 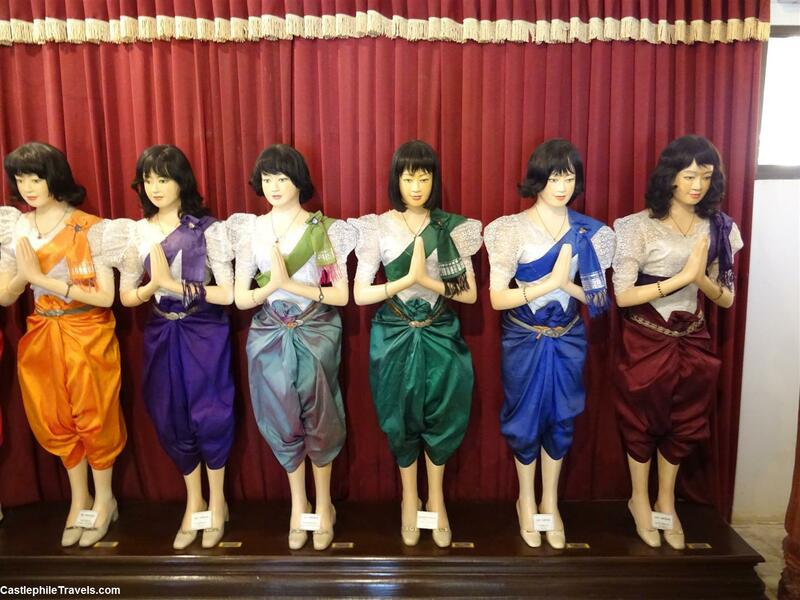 Mannequins inside the Hor Samritvimean wearing colourful costumes labelled as the days of the week. 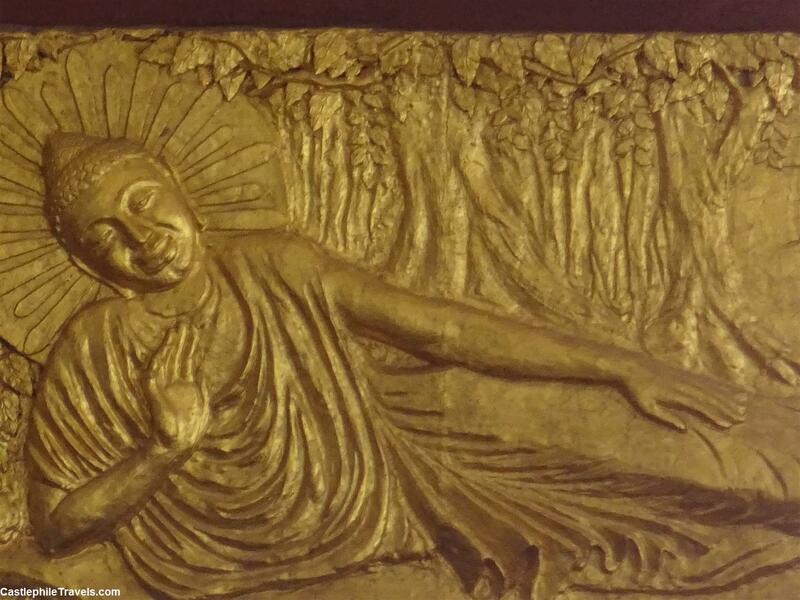 Wat Preah Keo is a Buddhist temple and contains an emerald Buddha. 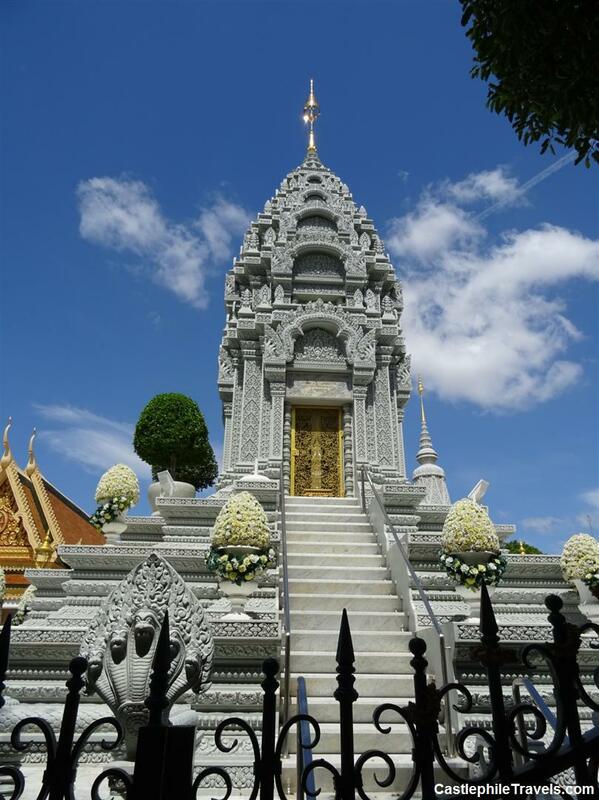 Wat Preah Keo is also known as ‘The Silver Pagoda’, because of the 5000 silver tiles that cover the floor. Unfortunately, these are hard to see, as the floor is covered up by carpet that protects the tiles from being damaged by foot traffic. 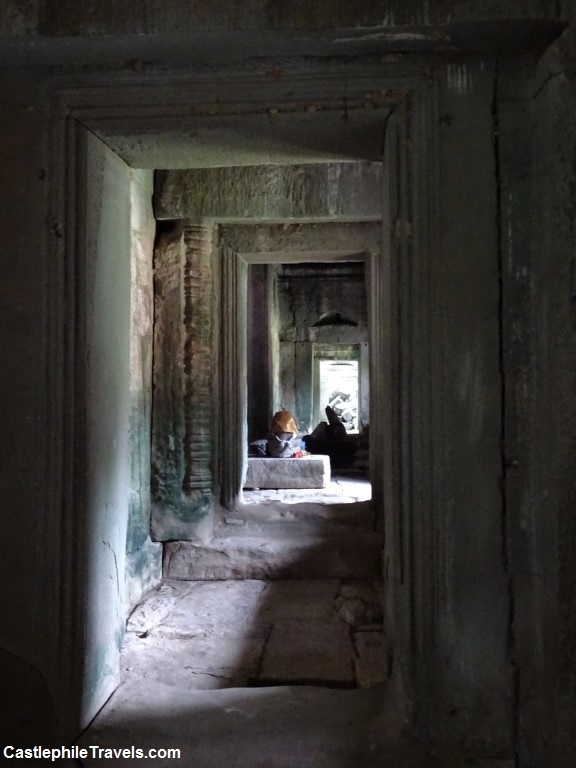 All visitors are required to remove their shoes before entering Wat Preah Keo – there are cubby holes outside where you can store your shoes. Out of all of the buildings in the Royal Palace/Wat Preah Keo complex, this was the one that I wished had more explanations in English. There were cabinets upon cabinets of statues, icons and precious objects, and I would have loved to have known more about them and their significance. Behind Wat Preah Keo is a model of Angkor Wat. 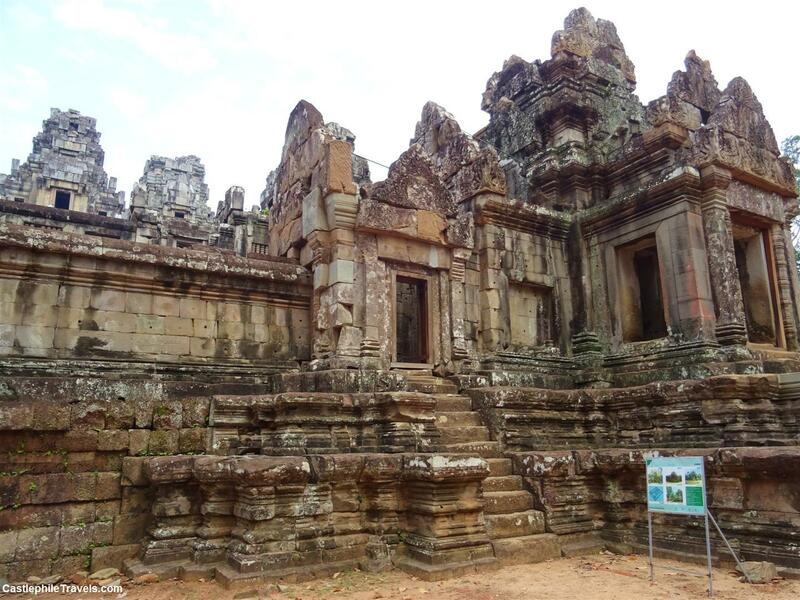 If you’ve been to the temple which is part of the UNESCO-listed Angkor region, compare it with your memories of your visit. 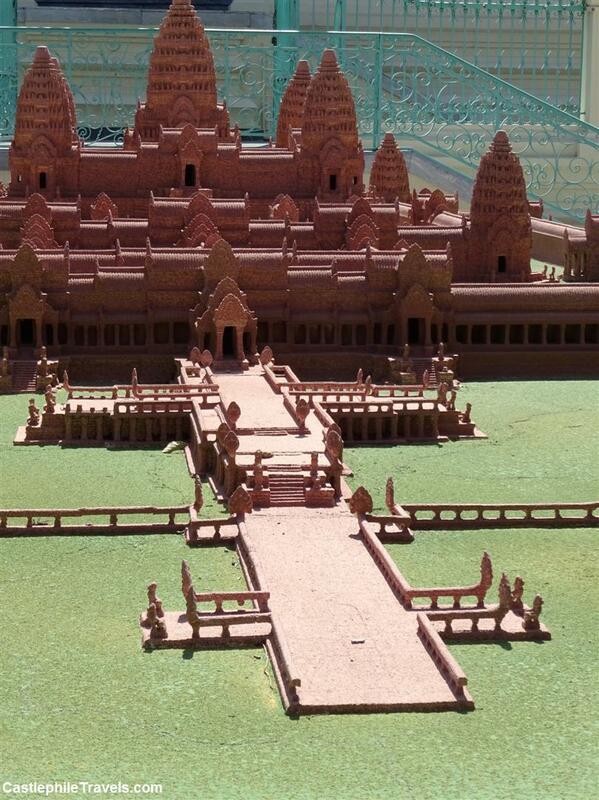 Or, if like me you’ve yet to go to Angkor Wat, get a bird’s eye view of the miniature version before seeing the real thing. 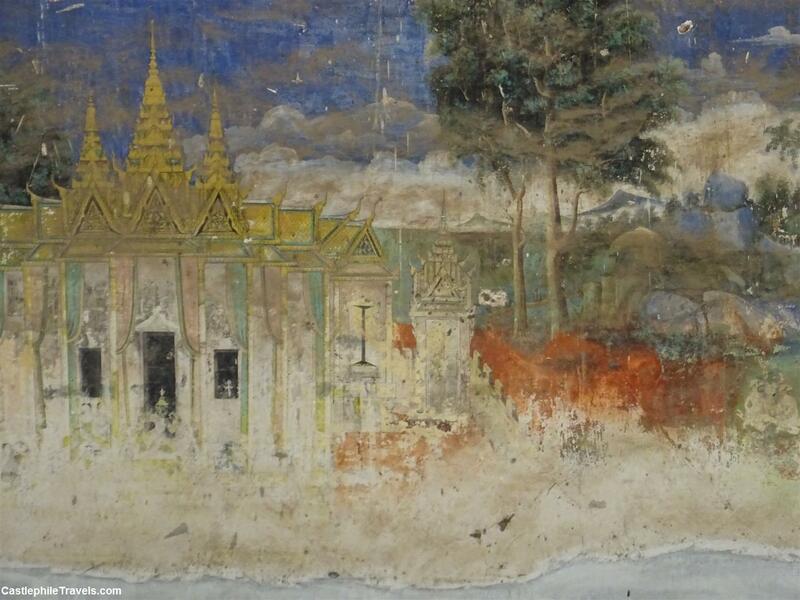 The Reamker mural is a Cambodian re-telling of the story of Ramayana. It was covered up for the most part during my visit as it was undergoing restoration, but I managed to glimpse some of the sections peeking out from behind the scaffolding. 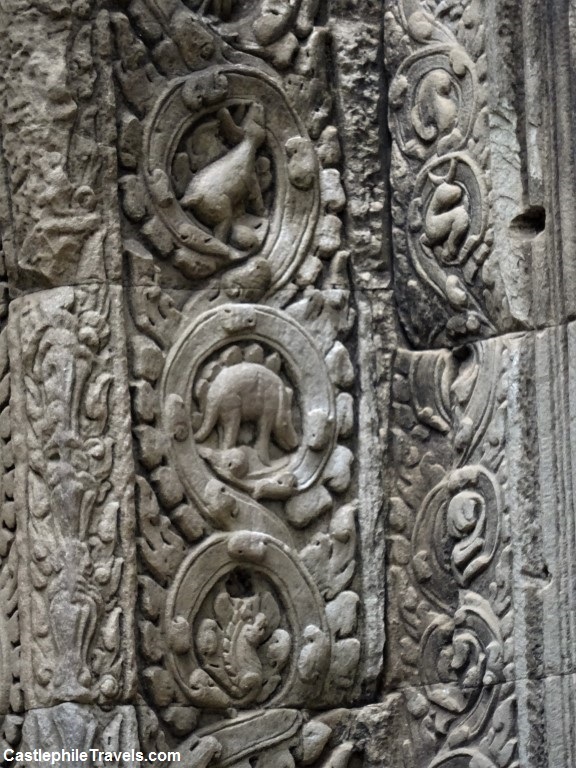 There are four intricately decorated stupas (memorials to members of the royal family) clustered around Wat Preah Keo. 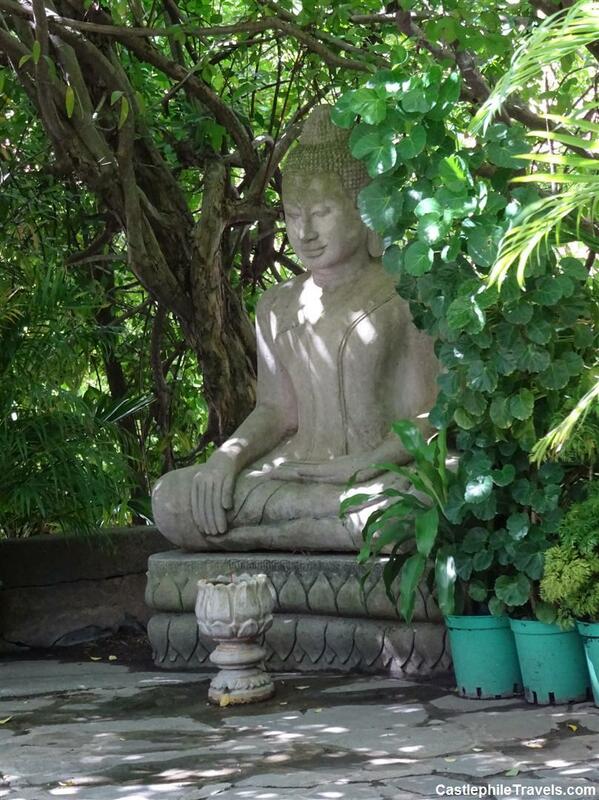 A statue of Buddha in the gardens of ‘Kailassa Mountain’. This shady garden wrapped around a hill provides visitors with a well-needed escape from the sun. 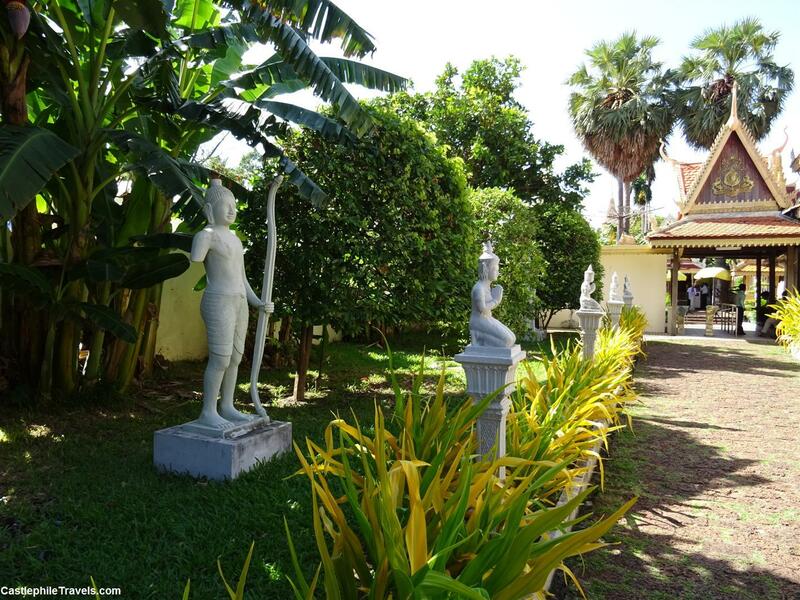 Take a seat on the stone wall and admire the plants and flowers in the peaceful garden, before setting off to explore more of the Royal Palace and Wat Preah Keo. After you have visited the compound of the Silver Pagoda, you pass by a series of exhibition halls on your way to the exit. 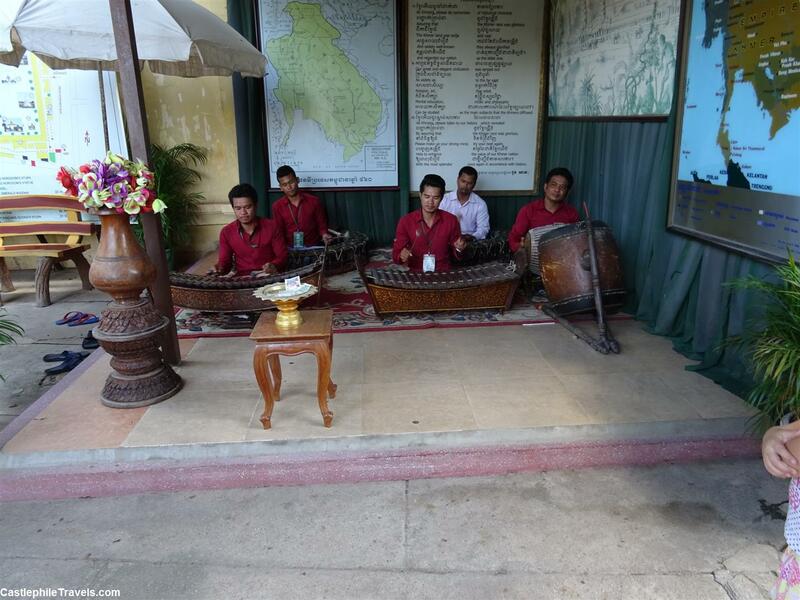 You’ll find on display various carriages, traditional Khmer folk dance costumes and masks, silverware, live music and weaving demonstrations. If the heat and humidity’s bringing you down, you’ll love the air conditioning in some of these rooms! The White Elephant. 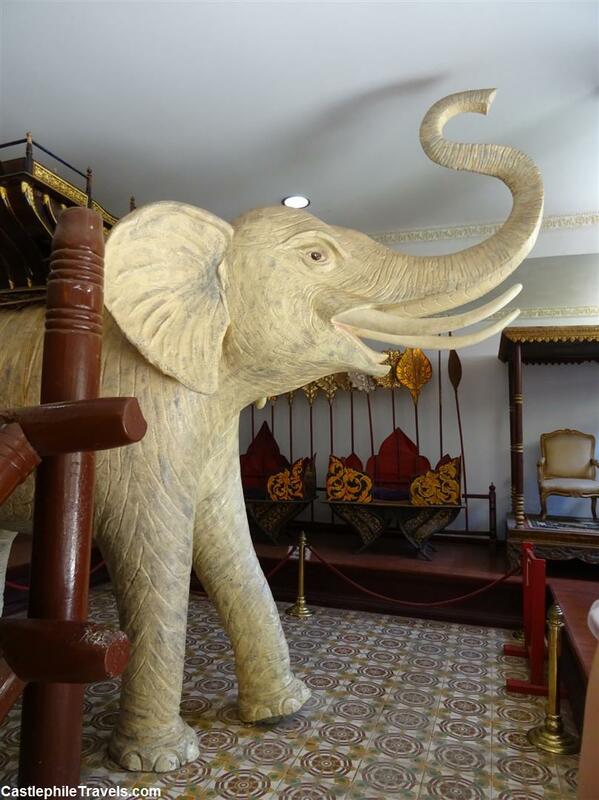 We stayed in this room for a while looking at the carved elephant – the air conditioning was lovely! 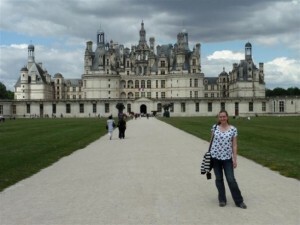 As it was my first time visiting a palace outside of Europe, I didn’t know what to expect. The palace buildings seemed lighter and more spread out than their European counterparts, and each building was essentially one big room. 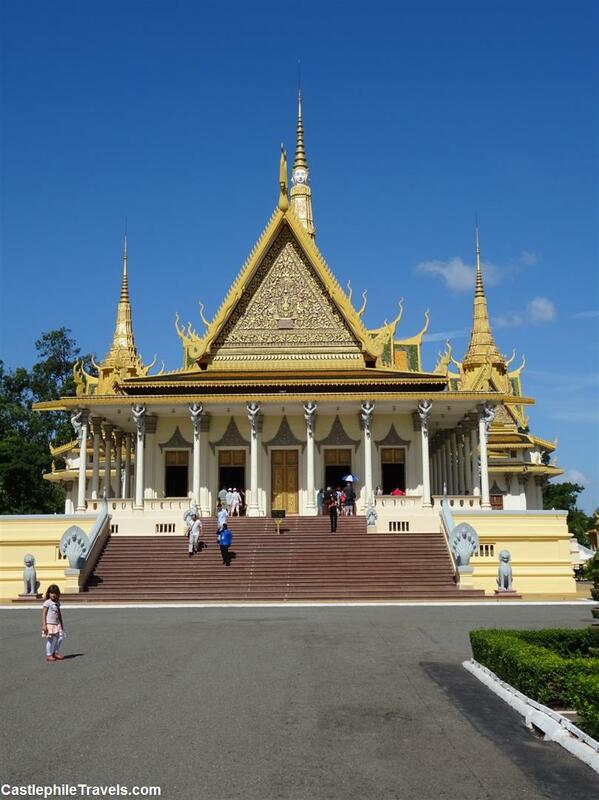 The Royal Palace and the Silver Pagoda were essentially two different compounds. 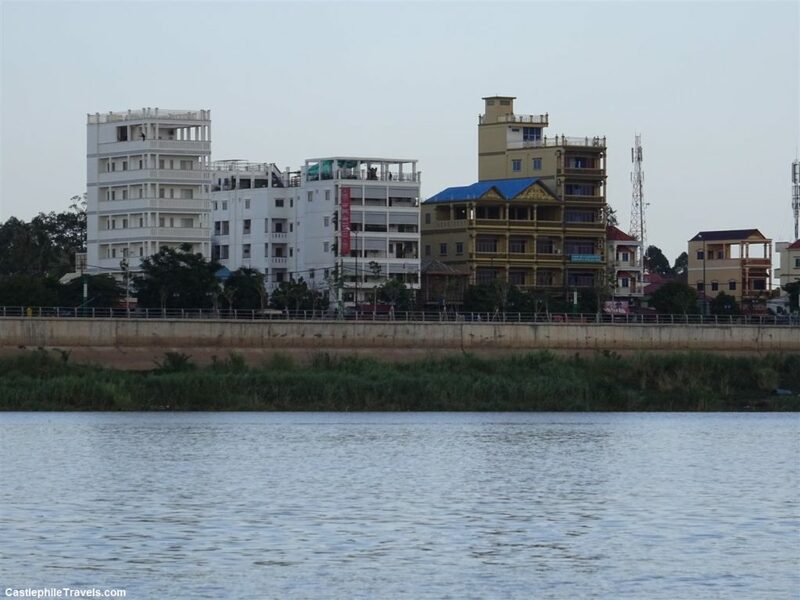 From outside the walls of the Royal Palace, it looks like the palace compound and the Silver Pagoda are part of the same space. Actually, they are two distinct compounds, separated by an alleyway and gates. The same ticket gets you in to both areas though, and once you’ve paid for your ticket at the entrance to the Royal Palace, there’s no need to show it again. Restoration. You’d think by now I’d expect there always to be some restoration going on when I visit a place – it seems lately it’s been inevitable. But during our visit, a lot of the buildings which would have been open were closed for restoration, including the Pavilion of Napoleon III and the Mural of the Reamker. We were outside for most of the time. Make sure you bring sun protection with you – you’ll be out in the sun a lot! 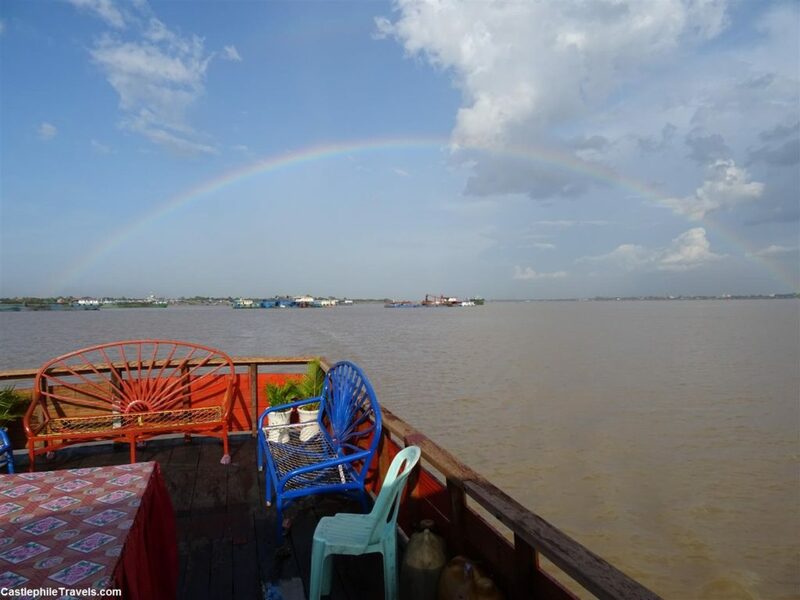 Guided tour or self tour? There are guides offering tours that you can find standing in between the palace entrance and the ticket booth, however we chose to wander around by ourselves. It was mostly fine. There were enough signs in English that helped us work out what things were, along with the map we were given when we purchased our tickets, though as you would expect most of the information was in Khmer. By hanging around a tour group for a little bit we were able to listen to a bit of information about the Throne Room, though it was a lot more detailed than I was looking for! 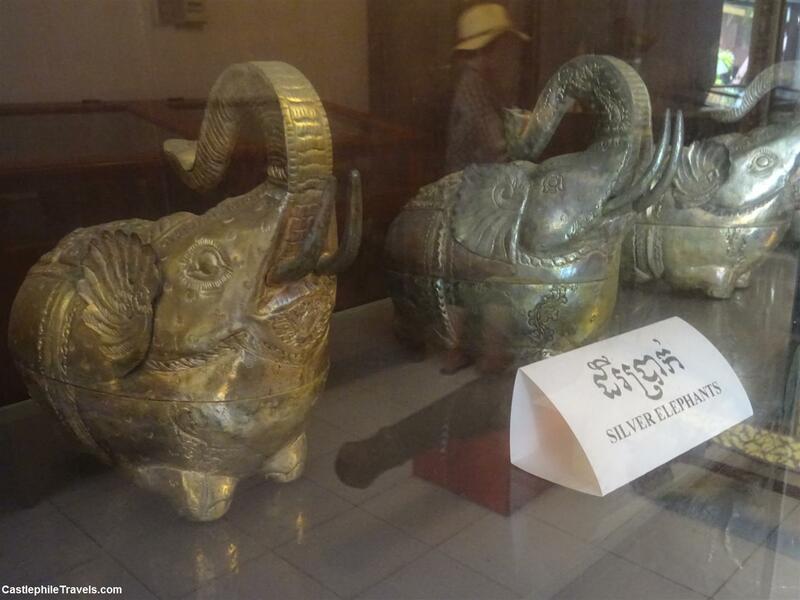 You cannot take photos of the inside of the throne room or inside the Silver Pagoda. These are well marked with signs and monitored. Photos are permitted everywhere else. 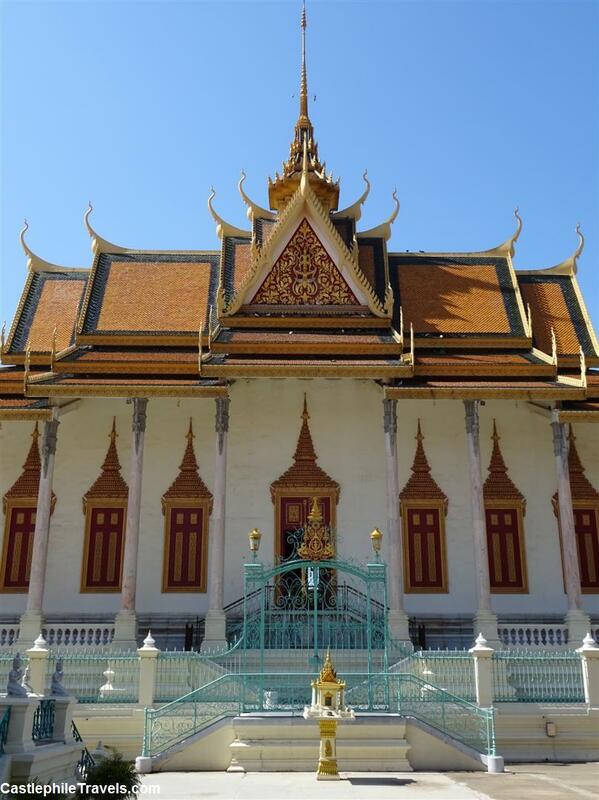 Have you visited the Royal Palace in Phnom Penh? Let us know your thoughts!